Accurate drug susceptibility testing (DST) of Mycobacterium tuberculosis in clinical specimens and culture isolates to first-line drugs is crucial for diagnosis and management of multidrug-resistant tuberculosis (MDR-TB). Resistance of M. tuberculosis to rifampicin is mainly due to mutations in hot-spot region of rpoB gene (HSR-rpoB). The prevalence of disputed (generally missed by rapid phenotypic DST methods) rpoB mutations, which mainly include L511P, D516Y, H526N, H526L, H526S, and L533P in HSR-rpoB and I572F in cluster II region of rpoB gene, is largely unknown. This study determined the occurrence of all disputed mutations in HSR-rpoB and at rpoB codon 572 in M. tuberculosis strains phenotypically susceptible to rifampicin in Kuwait. A total of 242 M. tuberculosis isolates phenotypically susceptible to rifampicin were used. The DST against first-line drugs was performed by Mycobacteria growth indicator tube (MGIT) 960 system. Mutations in HSR-rpoB (and katG codon 315 and inhA-regulatory region for isoniazid resistance) were detected by GenoType MDBDRplus assay. The I572F mutation in cluster II region of rpoB was detected by developing a multiplex allele-specific (MAS)-PCR assay. Results were confirmed by PCR-sequencing of respective loci. Molecular detection of resistance for ethambutol and pyrazinamide and fingerprinting by spoligotyping were also performed for isolates with an rpoB mutation. Among 242 rifampicin-susceptible isolates, 0 of 130 pansusceptible/monodrug-resistant isolates but 4 of 112 polydrug-resistant isolates contained a disputed rpoB mutation. All 4 isolates were also resistant to isoniazid and molecular screening identified additional resistance to pyrazinamide and ethambutol in one isolate each. In final analysis, 2 of 4 isolates were resistant to all 4 first-line drugs. Spoligotyping showed that the isolates belonged to different M. tuberculosis lineages. Four of 242 (1.7%) rifampicin-susceptible M. tuberculosis isolates contained a disputed rpoB mutation including 2 isolates resistant to all four first-line drugs. The occurrence of a disputed rpoB mutation in polydrug-resistant M. tuberculosis isolates resistant at least to isoniazid (MDR-TB) suggests that polydrug-resistant strains should be checked for genotypic rifampicin resistance for optimal patient management since the failure/relapse rates are nearly same in isolates with a canonical or disputed rpoB mutation. Widespread occurrence of drug-resistant tuberculosis (TB) and multidrug-resistant (MDR)-TB (infection with Mycobacterium tuberculosis strain resistant at least to rifampicin, RIF and isoniazid, INH; the two most effective first-line anti-TB drugs) is a serious threat to TB control success worldwide. According to global annual surveys conducted by World Health Organization (WHO), an estimated 490,000 cases of MDR-TB occurred among 10.4 million new active TB cases in 2016 . Compared to drug-susceptible TB, treatment of MDR-TB is more expensive, drug regimens are more toxic and require longer (18–24 months) duration of treatment which often results in clinical failure or disease relapse [1–3]. Unsuccessful treatment of MDR-TB is a risk factor for extensively drug-resistant TB (XDR-TB, infection with MDR-TB strains additionally resistant to a fluoroquinolone and injectable agent such as kanamycin, amikacin or capreomycin) which is often fatal in developing countries [2–4]. Accurate drug susceptibility testing (DST) of M. tuberculosis in clinical specimens and culture isolates to first-line drugs is crucial for rapid diagnosis of MDR-TB for proper patient management, for limiting further transmission of MDR-TB and development of XDR-TB [2, 5]. Although rapid liquid culture-based phenotypic DST methods are considered as the gold standard by WHO for identifying resistance to RIF, INH and other first-line drugs, these methods still require 1–2 weeks to report results [5, 6]. Molecular DST methods rapidly detect genetic mutations associated with drug resistance [2, 7]. Resistance of M. tuberculosis to RIF in 95–97% isolates is due to mutations in an 81-base pair (bp) hot-spot region (HSR) of the rpoB gene (HSR-rpoB) . The remaining 3–5% isolates contain mutations in N-terminal or cluster II region of the rpoB gene or in other genes [8, 9]. M. tuberculosis isolates with canonical (undisputed) HSR-rpoB mutations (like Q513P, Q513K, H526R, S531 L or S531 W, Escherichia coli numbering system, ) as well as isolates with mutations (such as V146F) in the N-terminal end of the rpoB gene exhibit high-level resistance to RIF which are readily detected by rapid phenotypic DST methods [8, 9]. Some molecular assays targeting HSR-rpoB are not specific as silent mutations in this region may occasionally lead to detection of false-positive RIF resistance . Recent studies have also shown that rapid liquid culture systems such as Mycobacteria growth indicator tube (MGIT) 960 system as well as the proportion method with shorter (4 weeks) incubation time often fail to detect strains exhibiting low-level (minimum inhibitory concentration, MIC of 0.5–2.0 μg/ml) resistance to RIF [11–14]. These low-level RIF-resistant strains with increased MICs below the critical concentration mostly contain specific mutations within HSR-rpoB, particularly at codon 511 (such as L511P), codon 516 (such as D516Y), codon 526 (such as H526N, H526L and H526S), and codon 533 (such as L533P) [11–14]. Mutation I572F in cluster II region of the rpoB gene also increases MICs below the critical concentration conferring low-level resistance to RIF [11–14]. Nearly 30% RIF-resistant M. tuberculosis isolates from Swaziland contained this (disputed) mutation and rapid liquid culture systems failed to accurately detect strains with this mutation . The clinical significance of some (D516Y and I572F) of these disputed (generally missed by rapid phenotypic DST methods) mutations in conferring resistance to RIF is indicated by gene replacement studies . Low-level resistance to RIF is clinically significant as patients infected with M. tuberculosis strains with disputed rpoB mutations often fail treatment or relapse [17–20]. The prevalence of M. tuberculosis isolates with disputed rpoB mutations is largely unknown since phenotypic DST in low TB incidence, high income countries is usually carried out by rapid liquid culture-based methods. This study determined the occurrence of disputed mutations in HSR-rpoB as well as I572F mutation in cluster II region of the rpoB gene in clinical M. tuberculosis strains phenotypically susceptible to RIF in Kuwait, a country with low (24 per 100,000) incidence of TB as well as a low (~ 1%) incidence of MDR-TB [1, 21]. Common mutations conferring resistance to INH were also detected [7, 9]. For isolates with an rpoB mutation, molecular detection of resistance for two other first-line drugs for which rapid culture-based DST methods are either cumbersome (pyrazinamide, PZA) [5, 6, 22, 23] or unreliable (ethambutol, EMB) [5, 6, 24–26] was also performed. A total of 242 M. tuberculosis isolates phenotypically susceptible to RIF were selected from our culture collection. The isolates were grown from 144 pulmonary (sputum, n = 131 and BAL, 13) and 98 extrapulmonary (fine needle aspirate and pus, n = 66; pleural fluid, n = 11; lymph node, n = 8; tissue, n = 7; cerebrospinal fluid, n = 4 and gastric aspirate, n = 2) specimens collected from 242 suspected TB patients as part of routine patient care at Kuwait National TB Reference Laboratory. The samples were processed for culture on solid (Lowenstein-Jensen) and liquid media-based automated MGIT 960 system. All the patients were newly diagnosed active TB disease cases and the isolates were cultured before initiation of anti-TB treatment. Data analyses were carried out on deidentified results. Non-sterile clinical specimens were processed by the standard N-acetyl-L-cysteine and sodium hydroxide (NALC/NaOH) method while sterile samples were processed directly . The NALC (0.5%) was used to digest the sputum specimens while NaOH (4%) and sodium citrate (2.94%) were used to decontaminate the sample. All specimens were cultured on solid (Lowenstein-Jensen) and MGIT 960 system media according to the manufacturer’s instructions and as described previously [21, 26]. The MGIT 960 system cultures were incubated for at least 4 weeks and cultures flagged positive for growth were used for the extraction of DNA by the rapid Chelex-100-based method, as described previously . The presence of M. tuberculosis complex DNA was detected by AccuProbe DNA probe assay and an in-house multiplex PCR assay, as described previously [21, 28]. The MGIT 960 system cultures were also subjected to phenotypic DST by using the SIRE drug kit (Becton Dickinson, Sparks, MD, USA), which contains streptomycin (SM) at 1.0 μg/ml, INH at 0.1 μg/ml, RIF at 1.0 μg/ml, and EMB at 5.0 μg/ml, as described previously [21, 26]. The tubes were incubated in the MGIT 960 system for at least 2 weeks or until the results indicating susceptibility or resistance were automatically interpreted and reported by using predefined algorithms which compared the growth in the drug-containing tube with the growth in control tube. Phenotypic DST for PZA was also performed on selected isolates, by using MGIT 960 PZA kit (Becton Dickinson) according to the manufacturer’s instructions. All mutations (including disputed mutations) in HSR-rpoB in the DNA samples were detected by GenoType MDBDRplus assay as described previously . This assay also simultaneously detects mutations at katG codon 315 (katG315) and inhA regulatory region (inhA-RR) which confer resistance to INH . The V146F mutation in the N-terminal region (outside the hot-spot region) of the rpoB gene was not targeted as this mutation confers high-level resistance to rifampicin . However, the I572F mutation in cluster II region of rpoB gene (also outside the hot-spot region) was targeted for detection in this study as this mutation confers low-level resistance to rifampicin and is frequently missed by rapid phenotypic methods [11–13]. The I572F mutation in the rpoB gene was detected by developing a multiplex allele-specific (MAS)-PCR assay. The detection of I572F mutation in cluster II region of rpoB gene was achieved by developing a MAS-PCR assay. For this purpose, three oligonucleotide primers (NArpoBF, 5’-TCATGGACCAGAACAACCCGCTGT-3′; NArpoBR, 5’-GTACGGCGTTTCGATGAACCCGAA-3′ and NArpoB572F, 5’-GGGCCCAACATCGGTCTGTT-3′) were designed. MAS-PCR reactions in a final volume of 50 μl contained 1x AmpliTaq PCR buffer I, 1 U AmpliTaq DNA polymerase, 8 pmol of NArpoBF primer, 8 pmol of NArpoB572F primer, 16 pmol of NArpoBR primer, 2 μl of DNA and 0.1 mM of each dNTP. Touchdown PCR cycling conditions were same and detection of amplicons on 2% agarose gels was performed, as described previously . The MAS-PCR should yield only one amplicon of 232 bp from reference strain M. tuberculosis H37Rv and clinical isolates containing isoleucine at codon 572 (I572, wild-type sequence) but two amplicons of 232 bp and 78 bp from isolates containing phenylalanine at codon 572 (I572F mutation). The results for all isolates with an rpoB mutation and for isolates with mutations at katG315 and/or inhA-RR indicated only by lack of hybridization with a wild-type probe were confirmed by PCR-sequencing of respective loci, performed as described previously . Common mutations conferring resistance to EMB (in embB gene) and PZA (in pncA gene) [2, 9] were also detected among M. tuberculosis isolates carrying disputed rpoB mutations. Mutations conferring resistance to EMB were detected by PCR-sequencing of embB gene as described previously . Mutations conferring resistance to PZA were detected by PCR amplification and DNA sequencing of two overlapping pncA fragments. The N-terminal fragment was amplified by using PNCANF (5’-GCGTCATGGACCCTATATCT-3′) and PNCANR (5’-TTCGAAGCCGCTGTACGCTC-3′) while the C-terminal fragment was amplified by using PNCACF (5’-TCCATCCCAGTCTGGACACG-3′) and PNCACR (5’-GCGCGTCACCGGTGAACAAC-3′) primers and the touchdown PCR protocol described previously . The amplicons were purified and both strands were sequenced by using the same amplification primers and the sequencing protocol described previously . The nucleotide and deduced amino acid sequences were compared with the corresponding sequences from susceptible strain M. tuberculosis H37Rv by using Clustal Omega. The isolates with an rpoB mutation were also subjected to spoligotyping to see if the isolates that have disputed mutation are clustered together. The procedure was performed by using the SPOLIGO TB kit (Mapmygenome India Limited, Hyderabad, India) according to kit instructions and as described previously . In brief, the 43 spacers within direct repeat region in M. tuberculosis isolates were amplified by using biotinylated Dra primer together with Drb primer, PCR products were hybridized to 43 spacer oligonucleotides embedded on Spoligo-membrane and the hybridization signals were detected by enhanced chemiluminescence. The detected bands were converted to 43 binary codes which were used for assignment of phylogenetic lineages according to SITVIT database (http://www.pasteur-guadeloupe.fr:8081/SITVITDemo/index.jsp). Quality control was ensured by using M. tuberculosis H37Rv and M. bovis BCG P3 as positive controls. Categorical variables were expressed as absolute number. Statistical analysis was performed by using chi-square test or Fisher’s exact test as appropriate and probability levels < 0.05 by the two-tailed test were considered as statistically significant. Statistical analyses were performed by using WinPepi software ver. 11.65 (PEPI for Windows, Microsoft Inc., Redmond, WA, USA). Phenotypic DST by MGIT 960 system showed that 64 isolates were fully susceptible to all four (RIF, INH, SM and EMB) anti-TB drugs (pansusceptible strains), 15 isolates were resistant to SM only, 51 isolates were resistant to INH only while the remaining isolates were resistant to more than one drug (polydrug-resistant strains). Among 112 polydrug-resistant strains, 75 isolates were resistant to INH + SM, 26 isolates were resistant to INH + EMB and 11 isolates were resistant to three (INH + SM + EMB) drugs (Table 1). Mutations in HSR-rpoB, katG315 and inhA-RR were detected by the GenoType MDBDRplus assay and/or PCR-sequencing. The data showed that all pansusceptible (n = 64) and SM-monoresistant (n = 15) isolates contained wild-type HSR-rpoB, katG315 and inhA-RR sequences (Table 1). All INH-monoresistant isolates (n = 51) also contained wild-type HSR-rpoB sequences, however, 15 (30%) isolates contained katG315 (S315 T) mutation while 20 (41%) isolates contained − 15 C/T and 1 isolate contained − 8 T/G mutation in inhA-RR (Table 1). Among 75 isolates with phenotypic resistance to INH + SM, 2 isolates contained a mutation in HSR-rpoB (both isolates contained H526N mutation), 58 (77%) isolates (including both isolates with H526N mutation) contained katG315 (S315 T) mutation and 11 (15%) isolates contained − 15 C/T inhA-RR mutation (Table 1). Among 26 isolates with phenotypic resistance to INH + EMB, 1 isolate contained D516Y mutation in HSR-rpoB, 10 (39%) isolates (including the isolate with D516Y mutation) contained katG315 (S315 T) mutation and 2 (8%) isolates contained − 15 C/T inhA-RR mutation (Table 1). Furthermore, among 11 isolates with phenotypic resistance to INH + SM + EMB, 1 isolate contained S531C mutation in HSR-rpoB, 6 (55%) isolates (including the isolate with S531C mutation) contained katG315 (S315 T) mutation while no isolate contained a mutation in inhA-RR (Table 1). Mutation I572F in cluster II region of the rpoB gene was detected by developing a MAS-PCR assay. The multiplex allele-specific (MAS)-PCR developed in this study accurately detected the presence of wild-type (I572) sequence at rpoB codon 572 in reference strain, M. tuberculosis H37Rv and presence of I572F mutation in a well characterized clinical isolate (5177/06) containing this mutation (Fig. 1). The isolate 5177/06 was detected as RIF-susceptible by MGIT 960 system . When MAS-PCR assay was performed on 10 selected pansusceptible and all 112 polydrug-resistant isolates, the data showed the presence of wild-type sequence (I572) at rpoB codon 572 in each isolate. Thus, I572F mutation was not detected and all disputed mutations were detected only in HSR-rpoB in this study. Furthermore, all isolates with a disputed rpoB mutation were polydrug-resistant strains. Altogether, 4 of 242 (1.7%) isolates phenotypically susceptible to RIF contained a disputed rpoB mutation, were also resistant to INH (containing the common S315 T mutation at katG315) and so should be classified as MDR-TB strains. The occurrence of a disputed rpoB mutation varied from 4 of 112 (3.6%) in polydrug-resistant isolates resistant at least to INH to 3 of 101 (3.0%) in isolates resistant to INH + one more drug. The relative occurrence of a disputed mutation was higher (1 of 11, 9.1%) in isolates resistant to 3 (INH + SM + EMB) drugs compared to 2 drugs (3 of 101, 3%). Also, the occurrence of a disputed rpoB mutation was higher in INH-resistant isolates additionally resistant to EMB compared to INH-resistant isolates additionally resistant to SM (2 of 37, 5.4% versus 3 of 86, 3.5%), however, the difference was not statistically significant. Another interesting observation was the decreasing proportion of inhA-RR mutations in INH-resistant M. tuberculosis isolates with additional resistance to increasing number of other (SM and/or EMB) drugs (Table 1). The proportion of inhA-RR mutations in INH-monoresistant isolates (21 of 51, 41%) was significantly higher compared to INH-resistant isolates additionally resistant to one more drug (13 of 101, 13%) (p = 0.000) or two more drugs (0 of 11, 0%) (p = 0.011). Further genotypic characterization of the 4 discrepant isolates (denoted as D1 to D4) containing a disputed rpoB mutation is shown in Table 2. PCR-sequencing of embB gene showed that both isolates phenotypically resistant to EMB as well as 1 isolate (D3) phenotypically susceptible to EMB contained M306 V mutation in embB which confers low-level resistance to EMB [16, 25]. Phenotypic DST data for PZA was available for 2 isolates only due to technical difficulties; 1 isolate (D3) was resistant while the other isolate (D4) was susceptible. The PZA-resistant isolate contained the well-characterized H51P mutation [22, 23] while the PZA-susceptible isolate contained wild-type pncA sequence. Another isolate (D2) for which phenotypic PZA susceptibility data was not available (due to lack of growth at lower pH) contained a non-synonymous (R2P) mutation in pncA. Thus, based on molecular screening, isolates D1 and D4 were additionally resistant to RIF, isolate D2 was additionally resistant to RIF and PZA while isolate D3 was additionally resistant to RIF and EMB (Table 2). Spoligotyping performed on all 4 isolates showed that they belonged to different M. tuberculosis lineages (Table 2). Kuwait is a low (24 cases per 100,000 population) TB incidence country . Nearly 80% of all TB cases and > 90% of drug-resistant TB (including MDR-TB) cases in Kuwait occur in expatriate subjects mainly originating from TB endemic countries of South/Southeast Asia (such as Bangladesh, India, Pakistan and Philippines) [21, 27, 30]. Phenotypic DST of M. tuberculosis isolates in Kuwait during 2002–2010 was carried out simultaneously by BACTEC 460 TB system as well as by MGIT 960 system, however, BACTEC 460 TB system was discontinued on January 1, 2011 and phenotypic DST has been performed only by MGIT 960 system since 2011. Resistance rates for any first-line drug, INH, 2 or more drugs (excluding INH + RIF with/without additional resistance, polydrug resistance) and INH + RIF (with/without additional resistance, MDR-TB) were reported as 12.4, 9.1, 2.5 and 0.9%, respectively . Rapid phenotypic methods (such as MGIT 960 system) are reliable for the detection of RIF-resistant strains with canonical rpoB mutations, however, they often fail to detect M. tuberculosis isolates with disputed rpoB mutations that exhibit low-level resistance to RIF [11–14]. In this study, we detected the presence of disputed rpoB mutations in 242 M. tuberculosis isolates phenotypically susceptible to RIF. 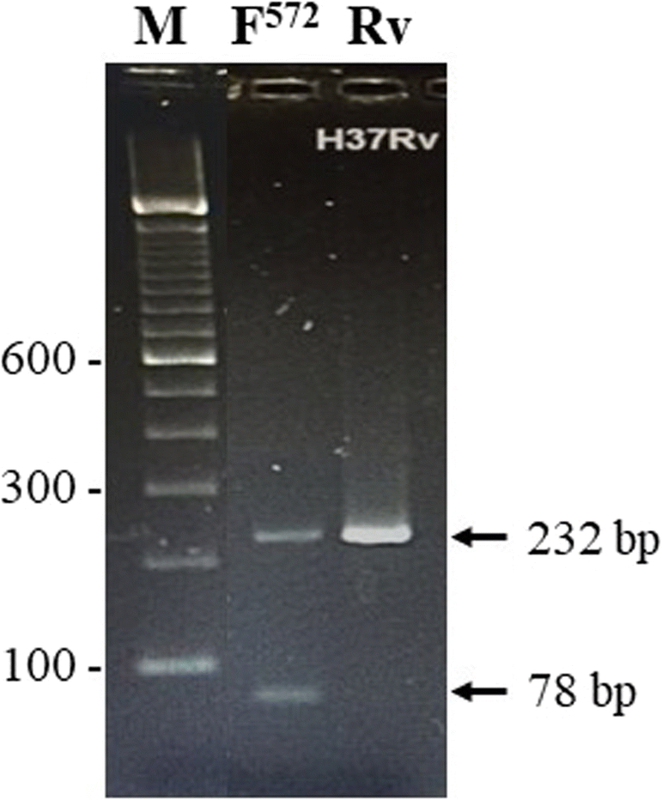 While mutations in HSR-rpoB were detected by a line probe assay, mutation I572F in cluster II region of rpoB gene was detected by developing a simple agarose gel-based MAS-PCR assay. Previously, I572F mutation was detected either by PCR-sequencing or by a real-time PCR assay [15, 20, 29]. Our data showed that 4 of 242 (1.7%) RIF-susceptible isolates contained a disputed HSR-rpoB mutation while I572F mutation was not detected. The H526N mutation was found in 2 isolates while D516Y and S531C mutations were found in 1 isolate each. The D516Y and H526N mutations have previously been shown to increase RIF MIC of M. tuberculosis by 2–10 fold [13, 16, 17]. Two of 4 patients infected with M. tuberculosis strains carrying D516Y mutation in one study failed to respond to standard first-line treatment . Similarly, 4 of 6 patients infected with M. tuberculosis strains carrying H526N mutation in another study either relapsed or failed treatment . The S531C is a rare HSR-rpoB mutation and an isolate with S531C mutation was previously detected as RIF-resistant by BACTEC 460 TB system and/or agar dilution method . However, the MGIT 960 system failed to detect RIF resistance in M. tuberculosis isolate (D4) with S531C mutation in this study. Interestingly, all 4 isolates with a disputed HSR-rpoB mutation in our study were polydrug-resistant (resistant to 2 or more drugs excluding RIF) strains resistant at least to INH (MDR-TB strains). The occurrence of disputed rpoB mutations has been reported in few studies. The occurrence of disputed mutations in one study (carried out on M. tuberculosis isolates from Bangladesh and Democratic Republic of Congo) was found to be much higher (in 13.1% of all isolates from Bangladesh and in 10.6% of isolates from Democratic Republic of Congo), however, unlike our study, M. tuberculosis isolates from both these countries were cultured from retreatment (failure and relapse/reinfection after primary treatment) patients . Two previous studies have reported the occurrence of disputed mutations among M. tuberculosis strains isolated from new TB patients [18, 20]. The data obtained in archived samples from Bangladesh showed that RIF resistance varied significantly among M. tuberculosis strains in different years (0.4% in 2005 versus 2.1% in 2010) and 7 of 1022 (0.7%) sputum samples contained M. tuberculosis with a disputed rpoB mutation . Since the prevalence of RIF resistance varied significantly in different years and the fact that Bangladesh is among the top 30 high TB burden countries , the data may not be applicable for low TB incidence countries. The data from Australia showed that 5 of 214 drug-resistant isolates contained disputed HSR-rpoB mutations . Among these 5 isolates, 4 isolates were monoresistant to INH and 1 isolate was monoresistant to PZA. None of 202 drug-susceptible M. tuberculosis isolates contained an HSR-rpoB mutation . In contrast, all our isolates with a disputed HSR-rpoB mutation were polydrug-resistant strains resistant at least to INH but none of our 66 monodrug-resistant isolates contained an HSR-rpoB mutation. Although the occurrence of RIF (and INH) resistance in 4 of 242 (1.7%) isolates appears to be higher than the reported occurrence  of MDR-TB in ~ 1% of M. tuberculosis isolates in Kuwait, the data should be interpreted with caution as the yearly occurrence of disputed rpoB mutations will likely be much lower (< 0.1%). This is because the proportion of polydrug-resistant strains was much higher (112 of 242, 46.3%) than normally reported (~ 3%) and the proportion of pansusceptible strains was much lower (64 of 242, 26.4%) than normally reported (~ 85%) among clinical M. tuberculosis isolates in Kuwait . The rare occurrence of disputed rpoB mutations is probably also related to the fitness cost associated with these mutations. Isolates with mutations at codon 526 and 531 (except S531 L mutation) generally exhibit significantly decreased fitness which may lead to their removal from circulation and replacement by strains with greater fitness . The clinical significance of disputed rpoB mutations is indicated by gene replacement studies and patients infected with such strains often fail treatment or relapse [17–20]. The clinical significance of disputed rpoB mutations in our study is also indicated by the following observations. i) All 4 isolates were resistant to INH and contained S315 T mutation in katG gene, an alteration that is strongly associated with acquisition of additional drug resistance leading to MDR-TB due to its minimal effects on fitness of tubercle bacilli [34, 35], ii) Molecular screening for EMB resistance showed that 3 of 4 (including 1 isolate phenotypically susceptible and 2 isolates phenotypically resistant to EMB) isolates contained M306 V mutation in embB gene that confers low-level resistance to EMB and is also strongly associated with MDR-TB phenotype [36–38], iii) Molecular screening for PZA resistance showed that 2 of 4 isolates (including 1 of 2 isolates for which phenotypic DST for PZA could not be performed) contained a pncA mutation that is either previously described in PZA-resistant strains [22, 23] or is highly suggestive of PZA resistance due to nonsynonymous mutation affecting the structure of pyrazinamidase, iv) Molecular screening for resistance conferring mutations showed that 3 of 4 isolates with a disputed rpoB mutation were actually resistant to three or all four first-line drugs (excluding streptomycin), and v) The isolates were genotypically unrelated as they were isolated at different (1 isolate each in 2005, 2010, 2011 and 2016) time points and all 4 isolates analysed by spoligotyping belonged to different M. tuberculosis lineages. Unfortunately, the final treatment outcome for the patients yielding M. tuberculosis isolates with disputed rpoB mutations was not available as the isolates were recovered from expatriate TB patients who were sent back to their respective country after initial treatment objective (sputum smear-negative status) was achieved. Similar observations regarding lack of final treatment outcome involving expatriate patients have also been recorded at other geographical locations . Two other observations are noteworthy in our study. Among INH-resistant isolates, the frequency of inhA-RR mutations was higher than katG315 mutations (42% versus 30%) in INH-monoresistant strains, however, this ratio was reversed in isolates with acquisition of additional phenotypic resistance to one more drug (15% versus 77% for isolates with INH + SM resistance and 8% versus 40% for isolates with INH + EMB resistance, Table 1). Furthermore, the inh-RR mutations were absent among INH-resistant isolates resistant to two other drugs. Our data support previous observations that fitness is not adversely affected by katG315 mutation and they are more likely to acquire resistance to additional drugs [34, 35]. Our data also support recent observations showing that katG315 mutations are significantly associated with additional resistance to SM and EMB and are more likely to cause unfavourable treatment outcome while inhA-RR mutations are mainly associated with additional resistance to SM only . Secondly, our data also reiterate the limitations of phenotypic DST for EMB as isolates with low-level EMB resistance are often missed by these tests [25, 26] and phenotypic DST for PZA which often yields unreliable or no result [5, 6]. In this regard, one isolate (D2) for which phenotypic PZA susceptibility could not be determined contained a non-synonymous (R2P) mutation in pncA. To the best of our knowledge, this (R2P) mutation has not been described previously in the literature [22, 23]. Substitution of arginine by proline at amino acid position 2 is likely involved in conferring resistance to PZA as many non-synonymous pncA mutations described in the literature involve replacement of a wild-type amino acid with proline [22, 23]. Thus, molecular screening provides drug resistance profiles that help in proper management of MDR-TB patients as ineffective drugs are not included in drug regimens [3, 9, 41, 42]. Our study has a few limitations. (i) The MIC values of the isolates with a disputed rpoB mutation to RIF were not determined and (ii) The details of the patient’s treatment history and clinical outcome were not available as all 4 patients were expatriate subjects who were sent back to their respective country after initial treatment objective (sputum smear-negative status) was achieved. In conclusion, 4 of 242 (1.7%) RIF-susceptible M. tuberculosis isolates in Kuwait contained a disputed rpoB mutation and all 4 isolates were polydrug-resistant strains. The occurrence of an rpoB mutation in polydrug-resistant M. tuberculosis isolates resistant at least to INH (MDR-TB) suggests that polydrug-resistant strains from patients suspected to have MDR-TB should be checked for genotypic RIF resistance since the failure/relapse rates are nearly same in isolates with a canonical or disputed rpoB mutation. The study was supported by Kuwait University Research Sector grant MI03/16. The funding body had no role in the design of the study, collection, analysis and interpretation of data or in the writing of the manuscript. Conceived and designed the study: SA, EM. Collection of data: NMA, HSE, SJ. Analyzed the data: NMA, SA. Manuscript preparation: NMA, SA, EM, HSE, SJ. All authors read and approved the final manuscript. The study was approved and the need for written informed consent from patients was waived by the Health Sciences Center Ethics Committee, Faculty of Medicine, Kuwait University (Approval no. VDR/EC/2947 dated 13-12-2016).